Here’s our FPL team tips GW15 article where the 1st group of the FFGeek contributors show their teams for GW15. In this part there’s Rob Reid, Jordan Sadler, Yaniv Salomon, Rob Cosgrove, Scott Hargadon and Sergio Torija. 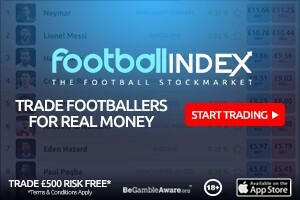 Here’s part 1 of the FPL managers who contribute to the FFGeek site with good histories who show their teams each week. This will give people a feel for what other managers are doing. It’s a fairly informal thing with no obligation on anyone and these teams may change at anytime before the deadline without further notice. It also wont cover early transfers. It’s just to give an idea of the trends for the week no more. Rob finished with a rank of 94k last season 22k in 16/17 4k in 15/16 and 7k in 14/15. When it’s bad, it’s bad and sadly my team continues it’s incredible slide that’s seen me fall nearly 500k places since my season high rank of 92k in GW4. I’ve had only 2 green arrows in that period and have suffered from a combination of bad luck and poor judgement. This week was another poor one, but things could have been a lot worse. It looked bad at 2pm on Saturday when I saw the team news and realised there was a real chance I would only field 9 players with a number of call-offs and benchings. My 2 City players didn’t even make the squad, Murray was benched and with Bennett benched on Friday along with Masuaku on Saturday it was looking bad. It wasn’t much better by Saturday night, Murray and Masuaku had scored a point each but my OR had slipped to nearly 600k. Sunday wasn’t going great either until the last minute of injury time in the Liverpool game. And then a stroke of luck with the most unlikely of assists from Virgil Van Dijk, providing a welcome 3 points and also securing another 3 bonus. It was a welcome, if highly fortuitous 6 point gain that salvaged something from what was another wretched week for my team. I’m hoping this positive end to the GW is the start of something good for my team – it might just be that little bit of luck I need to kick start my campaign. It’s strange how things go and how comically bad my season has gone so far! I only hope that you can all get a bit of schadenfraude from my misfortune and would suggest that you perhaps follow the advice of the more successful managers this season, while having a chuckle at me! 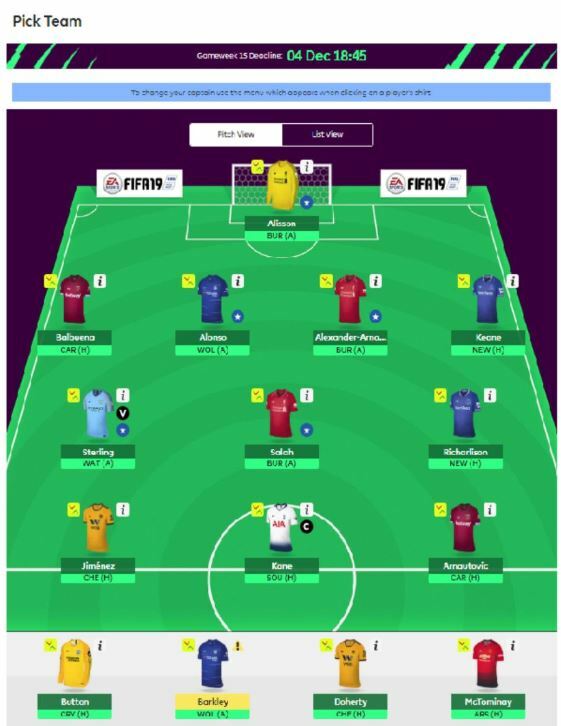 Onwards to GW15…. There is quite a significant fixture swing now and as such, I’m going to really shake up the core of my squad. First of all I’ve decided to adopt FFGs strategy of monitoring my squad. The primary worries for me are the last 2 on my watch list. These are high value players who need to be justifying their price tag, especially with a number of alternative options available. Pep’s comments regarding Kun’s game time over the festive period are a concern as at 11.5m you need to be in the team every week. Then there’s this ‘injury.’ If they are managing this, I can’t see him starting against Watford and suspect he may be on the bench to be used if needed and saved for the Chelsea game. Hazard is another worry. No goals since GW8 and only 2 assists in this period. At 11m again, I need more especially when you’ve got the likes of Sterling and Sane scoring points for fun. Chelsea’s fixtures are ok from GW16 but I’m also concerned that he’s still nursing that niggly back injury from earlier in the season and that he will also have his minutes managed. I’ve therefore prioritised the sale of these 2 with my 2 free transfers this week. The good news is that I’ll have lots of options at these price points. The tricky bit is deciding who to put in! Strikers first – it’s a straight decision between Kane and Aubameyang. Kane has the fixtures and we all know how explosive he can be. I’m a big fan of Aubameyang and he certainly has the form, needless to say I’m cursing not sticking with him for longer earlier in the season. Ideally I’d like them both in, but that can’t happen this GW without serious surgery. I’ve therefore brought Kane in initially with the slightly better fixture in GW15 and I plan to get Auba in for GW16 versus Huddersfield using a points hit and selling Murray, with Salah also going as the enabler. This should set me up nicely over the festive period. Now midfield and this has to be a City player really to make sure I still have coverage. 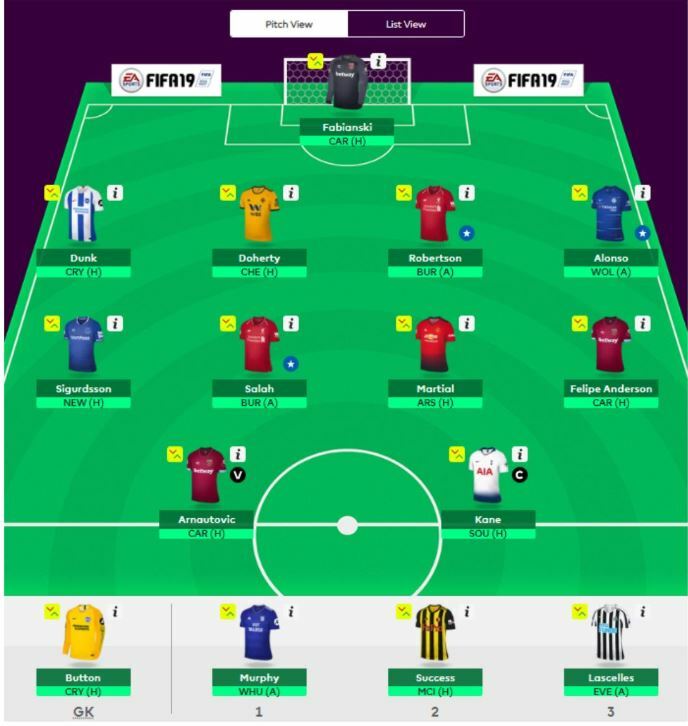 My long term strategy here is in fact to eventually have 2 City mids to cover rotation, but for this week I need someone who will free up some funds from the Hazard sale to enable the Kane move. It therefore comes down to Sane or David Silva and I’ve gone for the latter as I think he’s more likely to start on Tuesday, though I suspect Sane will find his way into my line-up at a later date. I am also considering a third move for -4 this week to tidy up someone from my Naughty Boy list. If I do, it will likely be to move out one of my Wolves players, probably Bennett. He was left out on Friday night for Saiss, but the Moroccan was poor in a dire Wolves defensive display so I could see Bennett getting his place back straight away. I’ll mull this over, but I’m not sure it’s worth a -4, especially seeing as I’ll probably take a hit at the weekend to get Auba in. It’ll therefore probably be GW17 before I can address these cheapies, just in time for Christmas! 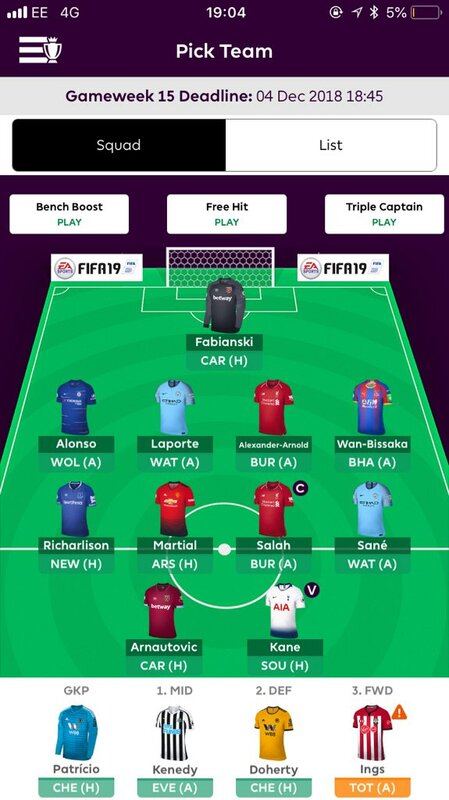 Main team decision then is captain and it’s a straight fight between Kane and Salah. Both face poor opposition – Spurs opponents Southampton are managerless at present so we don’t know how this will affect them. They were actually pretty good in the first 20 minutes versus Man Utd and do have a decent squad on paper, but it’s how the interim coach manages to organise and motivate them that could be key. Salah looked a bit off the pace against Everton and there’s also a doubt about Mane, which might affect his output. Opponents Burnley however are terrible at present, they made Andros Townsend look good last weekend! It’s a tough one, I’m leaning towards Kane at present but I’ll see what the polls say and make a final call on Tuesday pm. So all the best for GW15 folks and I look forward to you joining me in GW16 to see what latest disaster has befallen my ailing team! It was just a dreadful week for so many reasons and I’m glad Gameweek 15 isn’t far away so I can just forget it. To start the week I stupidly decided to change my goalkeeper last minute from Fabianski to Patricio because a league rival had Patricio which is something I never do so I don’t know why I did it. That cost me 7 points this week. Then Aguero didn’t start and I stupidly forgot to change my vice-captain to Sane like I meant to Friday which cost me 2 points. Then Sane gets absolutely robbed of an assist which just shows the inconsistency of FPL assists as he clearly tried to dink it over Begovic and the Premier League website even described it as a shot in their commentary but FPL decided it was a cross/pass and so “the keeper changed its intended direction” and so it wasn’t an assist. Honestly one of the most ridiculous and wrong decisions they’ve ever made, I was not happy at all and it cost me likely 4 points (or even 6 points if I vice-captained him over Salah). Then to top it off Martial was dropped as well and I can’t for the life of me work out why other than maybe just for rest. So, now my complaints are out the way, I had 7 returners which is excellent but unfortunately not a single one was over 7 and 6 of which were either scores of 5 or 6. Salah blanked which was very disappointing with him being my vice-captain. Laporte also blanked and the aforementioned Patricio blanked, then my other two blanks were Martial and Kenedy (who subbed in for Aguero). All in all it wasn’t a great week even though I had 7 players that returned. Last week I did the Stones + Mane > Laporte + Sane transfer for a -4 which was definitely worthwhile as if I’d not done it last week I’d have taken the hit this week anyone so I gained 2 extra points in theory by doing it then. This week I’ve done Aguero to Kane which was always my plan but Aguero not playing confirmed it further. My plan for after this Gameweek is just to save my transfer so I have a bit more versatility in what I can do after GW16, assuming there is no urgent transfer before then. Bench Decisions this week were pretty straight forward. Ings has Spurs away, plus Mark Hughes has just been sacked so that can’t be good for the team so he’ll be third on the bench. Doherty has Chelsea at home so he’s second on the bench. Finally Kenedy versus Everton away is my first sub as I think Newcastle will likely struggle to score against Everton. Also Patricio will be benched versus Chelsea over Fabianski who has Cardiff at home. it’s on Salah but I’ll probably just see what others do and go with the majority. Good luck with Gameweek 15. So, 6th green arrow in a row, with a fantastic score of 69 (20 above average), 8 returners, 2 good subs, Raheem my captain with 9 points and Arnie with an assist, I had 8 returners out of 11, and broke this year OR record with 7k, so nothing to complain. I was few seconds from 9 returners, but a bizarre goal from Origi, made it 8 returners, with only Keane , Richarlison and Salah (good for me) who didn’t return, fantastic week for my defence with 4 CS+ 1 goal from Doherty , and 2 bonus points from Alisson, a goal from fantastic Raheem (who I am counting on to bring me up the table) and 2 assists from dynamic Arni and Wilson. So, there will be no change in my plans, Kane is up for Kun (and it is not because of his injury), I saw yesterday Arsenal game, but I was not tempted to bring Auba instead of Kane, I do think that Auba will suffer in Old Trafford, while Kane will shine VS very weak Southampton defence. No special issues regarding my lineup, as Barkley and Doherty will rest, BTW, I will try to move Barkley and McTominay in the next game weeks but without a hit, I have some few budget players in mine, first is Andros Townsend and Kenedy is another one. Scott finished with an OR of 70k and 21k OR in 16/17. Another bad week. Will look to break the chain this gameweek. Aubameyang and Brooks in, Aguero and Barkley out. Will get Sterling in next week with funds saved because I think he will be rested this week. Chose Aub over Kane because in the end, they each had about equal positives and negatives. Kane has not played well where he is not the lone striker and that showed again yesterday. Aub was cheaper and seems to be on a roll and, like Kane, has good fixtures upcoming. I am hoping one of Robertson or Balbuena will recover. 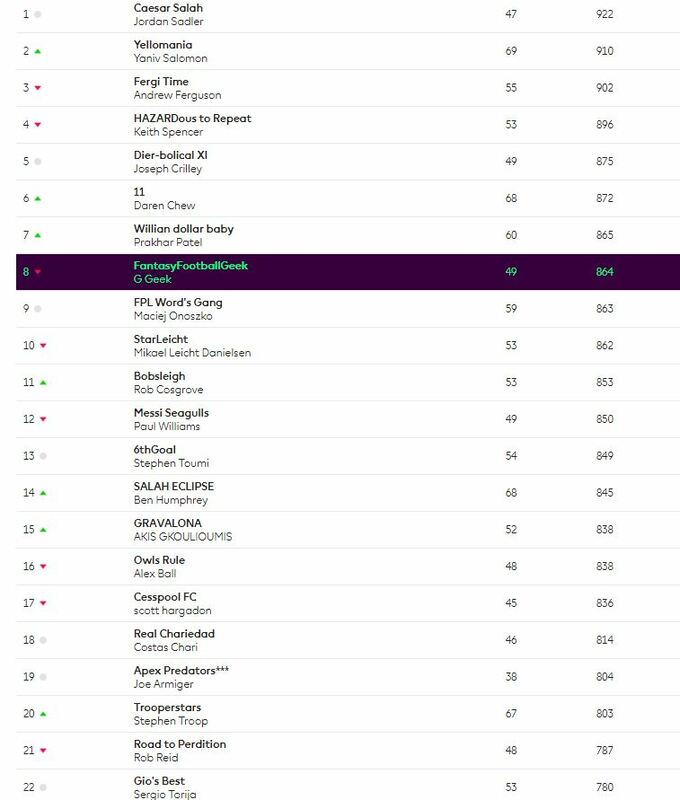 GW14 was a nothing week in all senses, 53 points just above the average, 2 million GW rank and no OR movement, no changes neither awaiting on more info for GW15. I was happy about my bench though, I needed the 3 subs to come in, only 8 points, but showing that a decent bench can be of help over the next month. 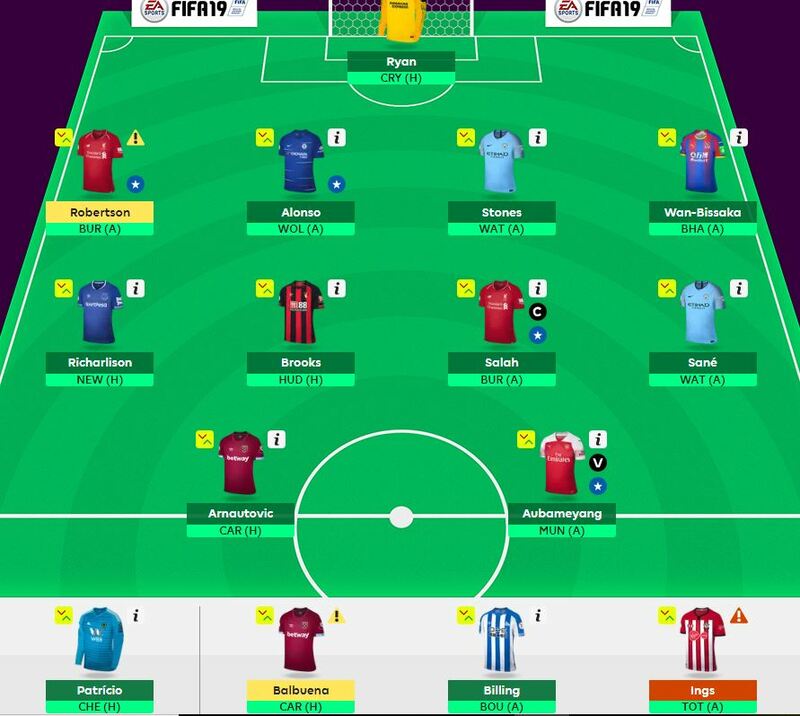 Good luck for GW15 Geekers !